Brooklyn, NY based EDM record label Brooklyn Fire, and New York, NY based entertainment marketing & PR firm UG Strategies, in collaboration with Live Nation and New York, NY based GBH Events, recently announced “EDM For Sandy Relief,” a benefit concert for The American Red Cross and Hurricane Sandy victims, in association with Sol Republic. On Monday November 19th, some of the biggest names in electronic music will gather at New York City’s Gramercy Theatre, to share their love for music, and more importantly, their love for New York City and those affected by the Hurricane Sandy. 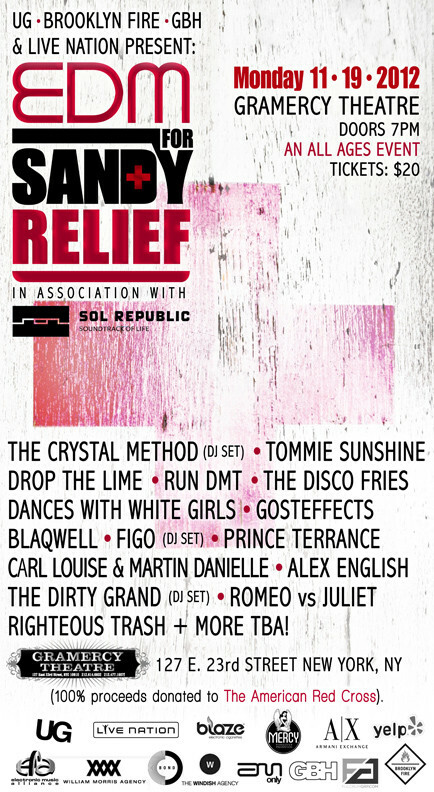 DJs performing at the benefit event, where 100% of proceeds will be donated to The American Red Cross, include: The Crystal Method (DJ set), Tommie Sunshine, Drop The Lime, Run DMT, The Disco Fries, Dances With White Girls, Gosteffects, FIGO (DJ set), Blaqwell, Prince Terrance (Hussle Club), Carl Louis & Martin Danielle, Alex English, Righteous Trash, and many more TBA. In addition, EDM For Sandy Relief will also be hosting a Thanksgiving food and clothing drive, as well as a silent auction with support from corporate sponsors including: Sol Republic, Armani Exchange, Live Nation, Yelp.com, Blaze Electronic Cigarettes, Fulcrum Promotions, Electronic Music Alliance, and Mercy Beverages. 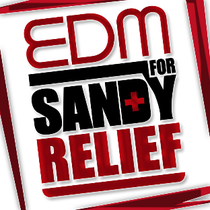 EDM For Sandy Relief is an ALL AGES event. Tickets are $20, with waived ticketing fees, and are available online at http://www.livenation.com.